Despite half a century of mining and development activities, which has resulted in the displacement of millions of tribals and indigenous people, India has no clear-cut resettlement policy. Bad enough as displacement is for an entire community, it is the women who get the rawest deal. In a society that does not allow them much status and exposure, they find themselves marginalised even further, without any access to economic alternatives. 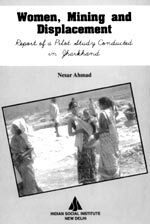 This study looks at the traumatic effects of displacement on Schedules Caste / Scheduled Tribe women in Hazaribagh and Chatra districts in Jharkhand. In most cases, they were not compensated for their loss of livelihood. They have very little food security and are at constant social risk. The study recommends forming a rehabilitation policy and well thought-out rehabilitation plans before any development project.